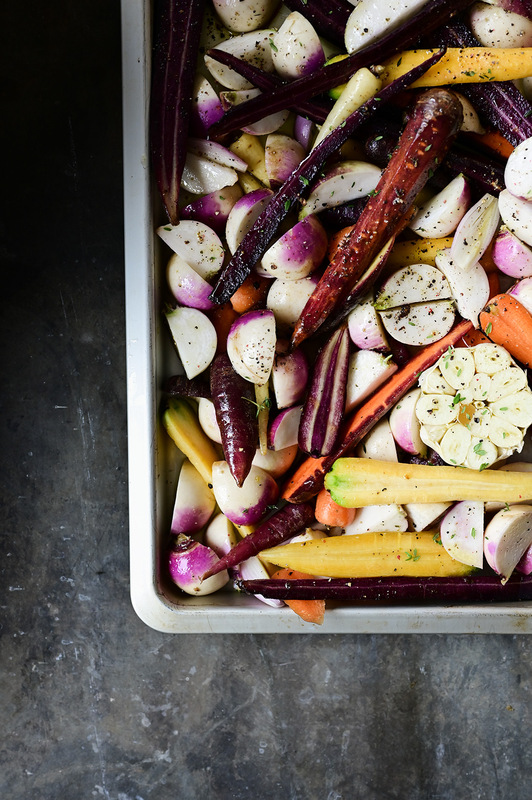 Roasted root vegetables are one of my favorites and will probably always be, love them! they’re easy to prepare, adaptable and delicious. There are so many things you can do with them. For some textural contrast simply add fresh vegetables, lettuce, roasted nuts or halloumi chunks after the tray is out of the oven. It’s also lovely served alongside roasted chicken or simply spooned over rice, as a side salad or on a bed of hummus. I thought turnips and carrots roasted with maple syrup, garlic and pistachios would be great for this winter season. I roasted the garlic cloves in their skin (which helps keep them moist and flavorful) and added a few chopped up shallots to complete this tasty side dish. It is basic but packed with a lot of flavor. Then served it with creamy hummus and a turmeric tahini sauce. This sauce is absolutely delicious and I’ll be drizzling it all over of my roasted veggies for the foreseeable future! Grab a fork and dig in! Peel and cut the carrots in half. Cut the small turnips in half, bigger ones in quarters. Combine the vegetables with the unpeeled garlic cloves, shallots, olive oil, maple syrup, thyme and lemon juice. Season with salt and pepper. Bake for 20 minutes at 190°C. Remove from the oven, stir, sprinkle with pistachios and bake for 10-15 minutes more, or until lightly browned. Drain the chickpeas, combine with all other ingredients in a food processor, and blend to a creamy purée. Combine all ingredients for the tahini sauce in a bowl. 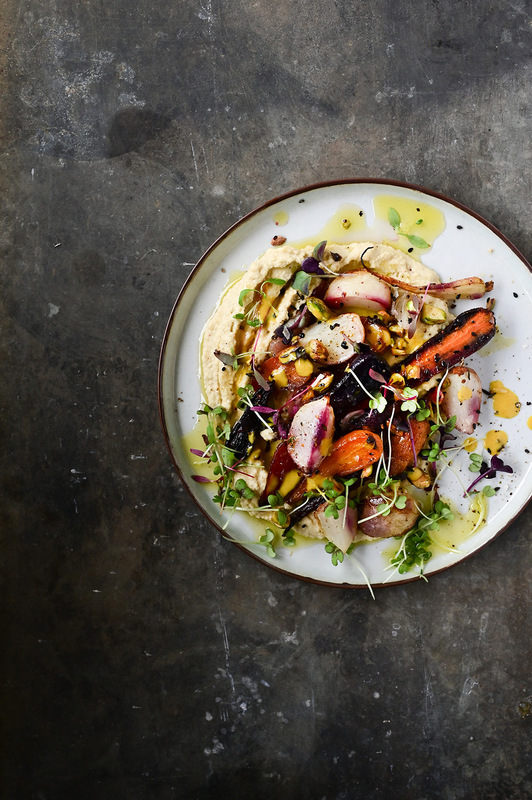 Serve the roasted vegetables with hummus, tahini sauce and micro greens. Sprinkle with chili peppers and black sesame, drizzle with olive oil and lemon juice. Enjoy! It sounds like an absolutely gorgeous meal! I think roasted root vegetables are so tasty anyway but that sauce really must make them taste amazing! thank you Corina! we liked it so very much!! This is my ideal kind of meal – love the sound of the tahini turmeric sauce. I saw this on instagram and commented there. It’s so beautiful. Presentation that sparks food joy! thank you Angela! glad you like this so much! This is such a beautiful plate of joyousness. Love the look and the flavours. I’m particularly excited at the thought of roasting turnips. I’m never quite sure what to do with them when they turn up in my veg box. Mostly they just go into a stew or curry. thank you!! and yes! roasted turnips are a must-try!! 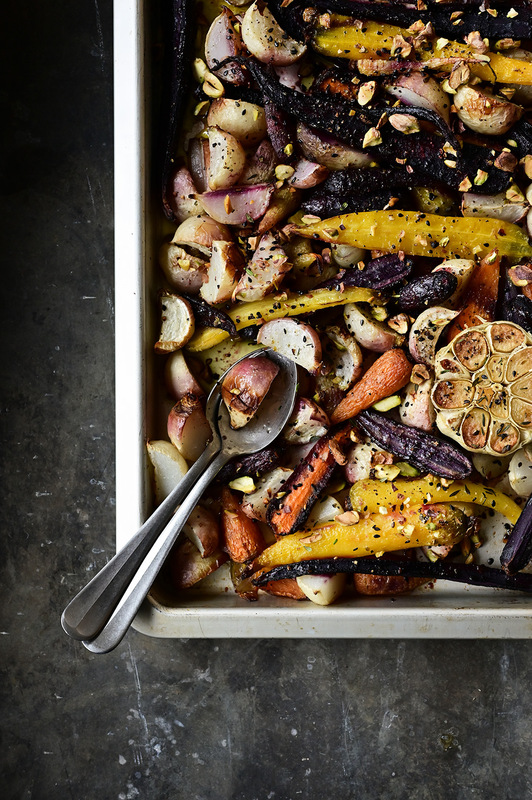 I often do roasted veggies but next time I am surely trying your tahini sauce!! thanks Heidi!! hope you love this as much as I do!